Megan Raker provides commercial real estate clients with efficient and pragmatic representation. With an eye for detail, she applies a collaborative approach to help clients achieve their goals. Her practice focuses on commercial real estate transactions, leasing and land use and zoning issues. She also serves as outside counsel for a real estate investment trust with international reach in the hospitality industry, offering litigation support to the organization. Clients benefit from Meg’s experience drafting commercial leases for both landlords and tenants, which provides her with valuable insight about what is important to both parties. 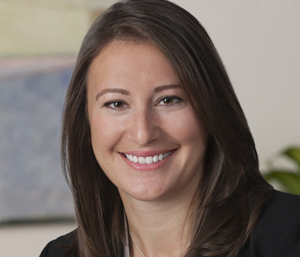 This perspective paired with her experience in real estate litigation enables her to anticipate potential issues that may arise and to encourage negotiation between parties. Meg also prepares Real Estate Purchasing Agreements for sellers and buyers, including seller financing options and related loan documents. Colleagues respect Meg and clients trust her with their legal matters because of the fervor and enthusiasm she brings to each unique case. She skillfully resolves disputes arising from contracts and operating agreements, intellectual property issues, real estate partnership matters and various workouts and collection related concerns. Meg is a member of the American Bar Association, the Maryland State Bar Association, the Bar Association of Montgomery County and the Virginia State Bar Association. She is admitted to practice in Maryland, DC and Virginia. Meg is an active volunteer with Best Buddies International and is a trained yoga instructor.